Thank you for stopping by my blog and liking my recent post. I love the images on your blog – so vibrant and engaging! I will be sure to visit again. Appreciate you liking my Melbourne Street Art post. Nice to find your blog. Love your pics. 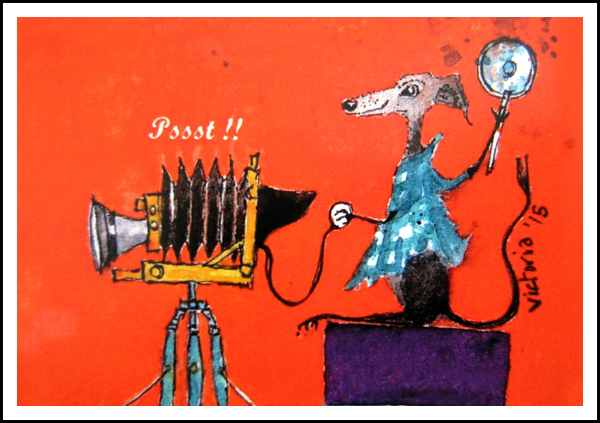 Wonderful, lively photographs! I’ll enjoy reading your blog!! Thanks for the like!! Hi Kitchinsink, Thanks for taking time to visit Postcard Cafe and for your kind words. If you have a website or blog perhaps you could leave details so I can take a look. Best wishes, Nigel. Hi Nigel, Great blog. I think about a week ago on a Friday I bumped into you in Sheffield near Niche Club and we spoke about graffiti and you pointed lots out for me. Many thanks for the help 🙂 I really do love your blog. Best wishes, Tahla. Hope to see you out and about some time. Fantastic blog! Looking forward to seeing more. Hi there! Thanks for stopping by my site:) I’m really enjoying your graffiti art posts!! Thank you for stopping by Musicologistblog and liking the quote of the week. You have a really unique blog! great pictures here, too. that (maintaining >1 blogs) is a lot of work, i assume? that lbos is easier to maintain than pc made very much sense to me. thank you for taking the time to explain and keep up the good work! I’ve only just found your site – I can’t wait to explore it now! This rain! Luckily the part of Somerset we live in hasn’t been flooded, but it’s been pretty bad! 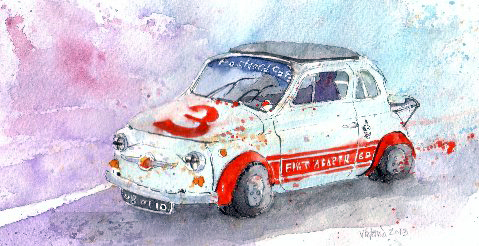 I’ve finally clicked over here from Victoria’s site–I knew right away that the Fiat was hers, so knew I was in good company. Hi Laurel, Sorry its taken me a while to reply. Although I run a couple of photo-blogs I think the world is spinning too fast already without me rushing around. Slow is the new fast! Thanks for stopping by and taking an interest in Postcard Cafe. I only have two tanks on the blog. They are resting unused and have only recently received the attention of local artists. I love the “Fish Tank” and “Think Tank” and they both disarm the ordnance on which they are painted. I also like how coLor painted “Heavy Art-illery” on one of the vehicles. It was great to come across these and they made me smile. Oh I so wholeheartedly agree with you about the speed of life. It is dizzying! So much clever art in one area–quite amazing, that. Hi Jim, Thank you for the kind feedback. The Old Sweet Shop has so much good stuff. Emma that runs it has supported the artistic community with her shop for over 6 years now which is pretty good going for any small business these days. Best wishes, N.
yes, I’d always missed it, unbelievable since I get loads of records out of that oxfam opposite, an it immediately became one of my favourite shops in Sheffield today. Going to have to do a post or something about it on my blog thing. Loving this site. Fantastic pictures that show me another side of where I live. Many thanks. Many thanks for your comment. I’m pretty new to this blogging lark so really appreciate you having looked. Love your site! The wordpress community is a friendly one. 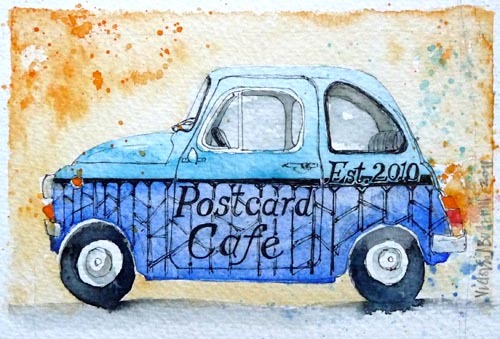 The number of people who follow Postcard Cafe has just grown organically without me trying or tweeting or any other kind of publicity. I’m sure that people will pick up on your blog. I think I arrived at it because it was tagged with Sheffield. I enjoyed seeing all the albums that soundtrack your life. Mott The Hoople released some great records and Ziggy Stardust is of course an all time classic. Hi There! An awesome corner of the web you have here. Plus, so much Phlegm, much of which I’ve never seen before!!! The latest post is of the most recent Phlegm painting in Sheffield taken at night! There is a search bar on the blog so you can just type in Phlegm to see his work going back over the years.